Bruce and Krystyna went all out on their wedding day, and they could not have asked for better weather for their ceremony. 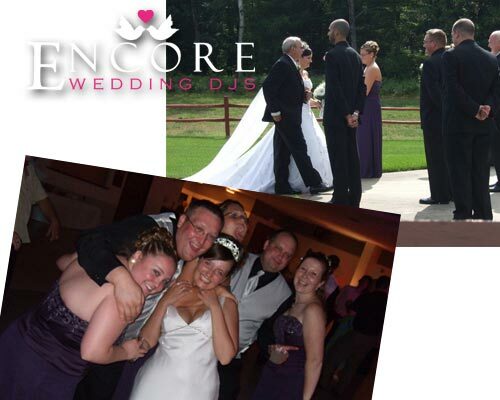 We helped them for the ceremony by providing ceremony song selection, music playback, and wireless technology so that everyone could hear them exchange their vows. We actually were not in Houghton Lake, but just down the street in Prundenville Michigan. The reception was really cool and we really got some really great photos throughout the night. Now this was a first for me, and I have done a countless amount of fun classy weddings. Before the dollar dance, the bride and grooms friend auctioned off the first dance. Their friend owns an auctioning company so it was pretty interesting when people were yelling and calling bets. I could never speak that fast! One of the highlights of the night was the wall lighting that covered every wall in the reception hall. Bruce and Krystyna got 20 accent lights so that their walls were a deep purple during dinner cocktail. During the dancing portion the endless combination of colors was limitless (hence any wall any color). You can view their satisfaction survey at the link. Thanks again guys for inviting us to your celebration!